AFOR Systems, Inc. was founded by Bill Wilson and Joe Tulkoff in 1996 to bring to market the MARSTM – a state-of-the-art, automatic metal removal system for the bulk materials industries. A few years ago, It was recognized that the traditional use of magnets and metal detectors to remove tramp metal from bulk materials was not particularly effective nor efficient. Because magnets attract only ferrous (that is, iron or steel) metal, they do not offer total protection against all tramp metal. And, while metal detectors can identify all tramp metal (ferrous and non-ferrous), they can’t remove it – they can only stop the belt for the metal to be removed manually. This shuts down production and leaves expensive processing equipment vulnerable to human error. 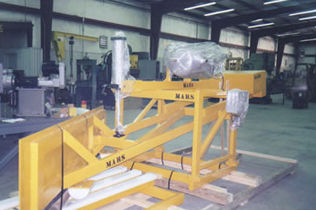 Although MARS installations are currently concentrated in the aggregate industry, the MARS is effective in many industries, including crushed stone, sand and gravel, mining, coal, slag, power plant, pulp and paper, chemicals, food products – essentially any industry handling bulk materials, looking for the total solution for tramp metal removal. AFOR Systems is committed to satisfying its customers, offering the best in equipment and service.